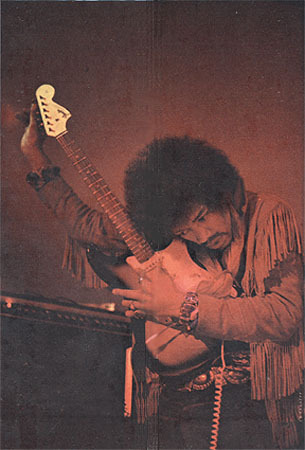 Jimi Hendrix: In my opinion, the best rock guitar player that ever was. A great thrill to have shared this life with him. Oh, there are others that are faster and so on, and so forth, but Jimi was unique in so many ways. When he played, it was as though his thoughts went straight from his head right to the guitar ... and then back again. I got the feeling he was enjoying it as much as the audience, maybe more. Many times he'd play and be chewing gum at the same time, just crankin' it, enthralled with it. That may sound like a funny thing to remember about him, but check him out in some of the existing film footage. At times, you would swear the guitar was playing him, this lanky figure that just "owned" the guitar! He had long fingers and at times, would run his thumb up and down the guitar neck, then turn around, put his elbow over the strings and do a slide. All with the most natural of moves. Probably the sexiest guitar man ever. I had the opportunity to jam with Jimi after a gig at the Whiskey A-Go-Go in Hollywood. 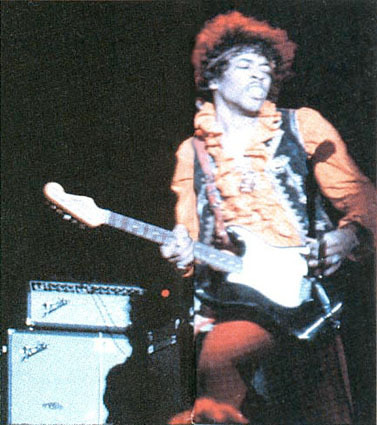 Here's a picture of him, playing on my Bruce Amps at the Whiskey that night in 1969, when he sat in with another group on the card. The picture was used in the first album released after his death. It was called "Cry of Love". Made me proud. Jimi sent word to me, inviting me to a jam after the gig at the Whiskey. "Experience" drummer, Mitch Mitchell was also in on the jam. Unfortunately, there were about 25 other guitarists there, as well, who had gotten word of it. It was backstage, in the old Vine Street Theater, where the Joey Bishop show was filmed. Regis Philbin was Joey's sidekick at that time. Anyway, Mitch was there early (about 2:30 a.m.) and we jammed awhile. When Jimi showed up, everybody went crazy and started playing as loud and as fast as they possibly could. Twenty-five guitar players, all playing LEAD! Every lick they ever learned in their life, just as fast as they could, kind of like, "Look, Jimi!! Look at me!" In other words, it was AWFUL! Such a let down. Such a wasted opportunity ... or so it seemed. It was a small room and I was sitting towards the back. After about 20 minutes of "garbage", Jimi kind of got disgusted, although he was polite. He put down his guitar and picked up a bass, (strung standard tuning, right handed) ... turned it upside down and was about to begin. At that point I thought, "what the hell", so I grabbed my chair and dragged it right down through the middle of them all, sat face to face with Jimi, (we were about 5 feet in front of Mitch's bass drum) and I just laid down a nice, simple "chord groove thing" that he could jam to comfortably. He was smiling and all of us were having a ball, even though it was still pretty much "gang guitar world". After awhile, about 4:00 in the morning, it was over. Now understand, I'm not claiming to have been a close friend of Jimi's. I was a young man of 21 or 22 years old and in awe of him, just like everyone else in the room. Let's not put on any airs concerning that. I was putting my guitar away and feeling a little timid, when he came up next to me and began putting his Stratocaster in the case. He looked at me and said with a sigh, "thanks, man", referring to me laying down a groove instead of just blasting away. I suppose I'll be telling that story for about 60 years. He was amazing. His sense of melody permeated even his wildest jams. When he played the guitar, it sang. He wasn't a bad bass player, either. These times were about 1969 and 1970. Later, we played a gig together at the "Denver Pop Festival", (Frank Zappa was there also) which turned out to be the very last gig that all three original members of "The Experience", played together. That is, Jimi, Mitch and Noel Redding on bass. Another gig that we did together was one in Devonshire Downs, which is in the Northern part of the Los Angeles basin. Somewhere, I have pictures from that day. I'll try to find them and post them on this website. Actually, we played a different day of the festival than he did. I distinctly remember the morning I woke up and heard the news that Jimi had died in London. It was very sobering for me. I had to go to the studio because we were working on an album. When I showed up, I mentioned to our producer, Richie Podolor, that Jimi had died. Richie is a huge talent and more than just a good friend of mine. What he said to me caught me completely off guard. He said " Well, I guess the slot is open, Michael." He didn't mean it like it sounds, but I just broke down and cried. Richie felt horrible, of course, but I know he didn't mean to be insensitive. It was just a reckless comment. To sum all this up: after a few years, Jimi's music kind of fell from grace, with all the bad compilation albums of outtakes and so forth, that flooded the market ..... and THEN, it made an amazing comeback and has remained in vogue ever since. His legacy is secure. I am so proud to have crossed paths with him. There are many great guitar players in this world. Many. Still, Jim Hendrix was THE VERY BEST I'VE EVER HEARD OR SEEN. For me, nobody else could compare to him. He launched an approach, an attitude that still rings out loud and clear, through all the rock guitarists that have come down the pike since him. Stevie Ray Vaughn obviously loved Jimi. Innovator? For sure. Jimi's fashion statements aren't talked about much, but he was a trendsetter in that realm as well. His photo's still hold up. He always struck me as this kind of "Cocky Bold" character with charisma, that was only surpassed by his playing and his writing. Axis: Bold as Love. He'll forever burn in the history of rock n roll, and rightfully so.